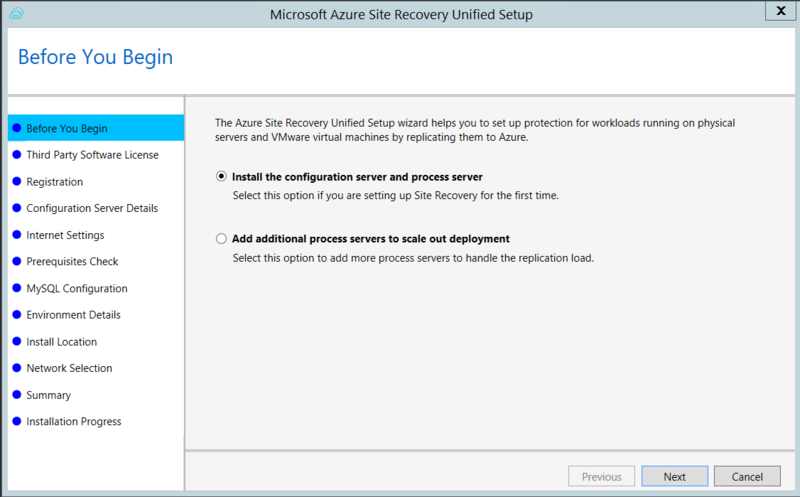 The Azure Site Recovery service contributes to your disaster recovery strategy by managing and orchestrating replication, failover, and failback of on-premises machines, and Azure virtual machines (VMs). Make sure that you understand the architecture and components for this scenario. Make sure that the servers you want to replicate comply with Azure VM requirements. Prepare Azure. You need an Azure subscription, an Azure virtual network, and a storage account. Prepare an account for automatic installation of the Mobility service on each server you want to replicate. After failover to Azure, physical servers can't be failed back to on-premises physical machines. You can only fail back to VMware VMs. 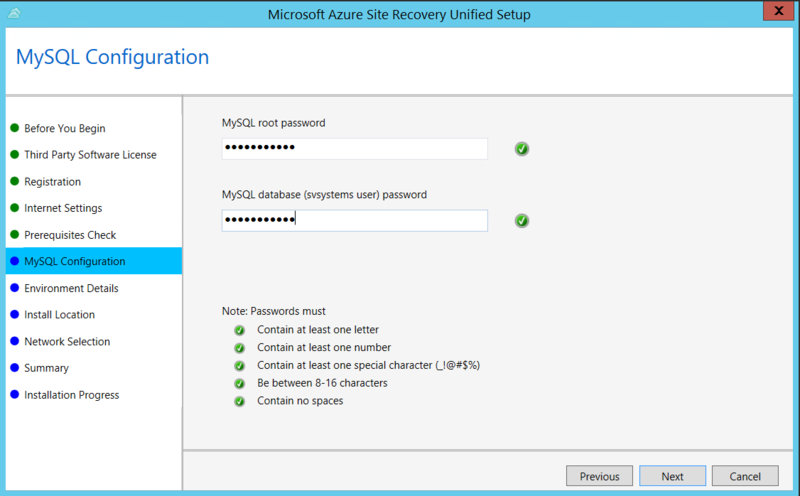 Set up the replication source, including the Site Recovery configuration server. Set up the replication target. Configure a replication policy, and enable replication. Get a Microsoft Azure account. You can start with a free trial. Learn about Site Recovery pricing, and get pricing details. Find out which regions are supported for Site Recovery. Make sure your Azure account has permissions for replication of VMs to Azure. Review the permissions you need to replicate machines to Azure. Verify and modify role-based access permissions. Set up an Azure network. Azure VMs are placed in this network when they're created after failover. Set up an Azure storage account. 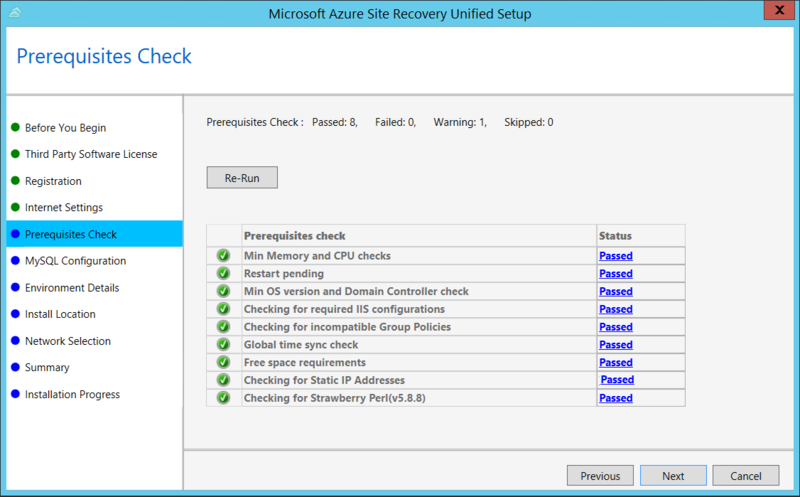 Site Recovery replicates on-premises machines to Azure storage. Azure VMs are created from the storage after failover occurs. 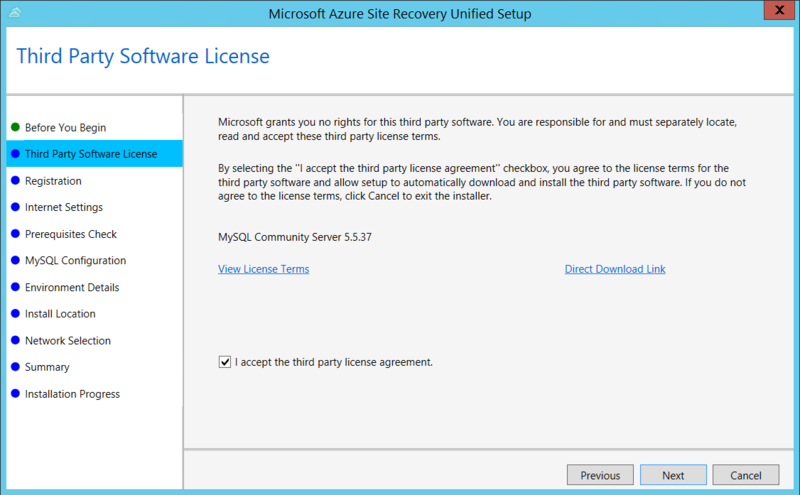 The storage account must be in the same region as the Recovery Services vault. The Mobility service must be installed on each server you want to replicate. 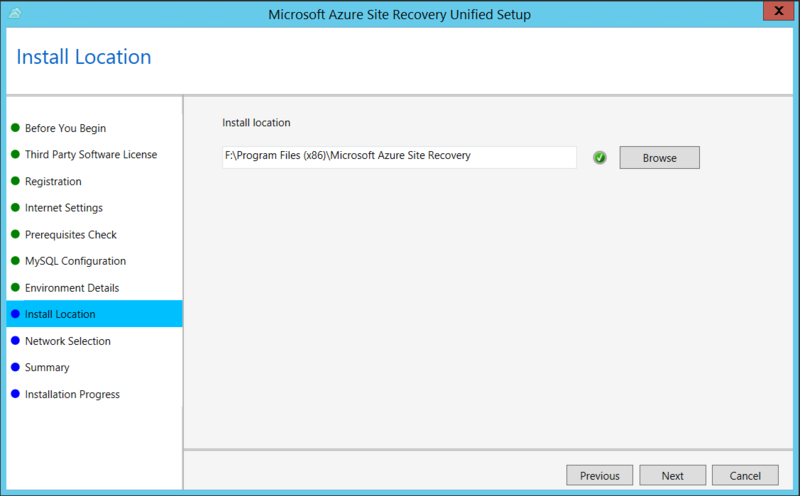 Site Recovery installs this service automatically when you enable replication for the server. 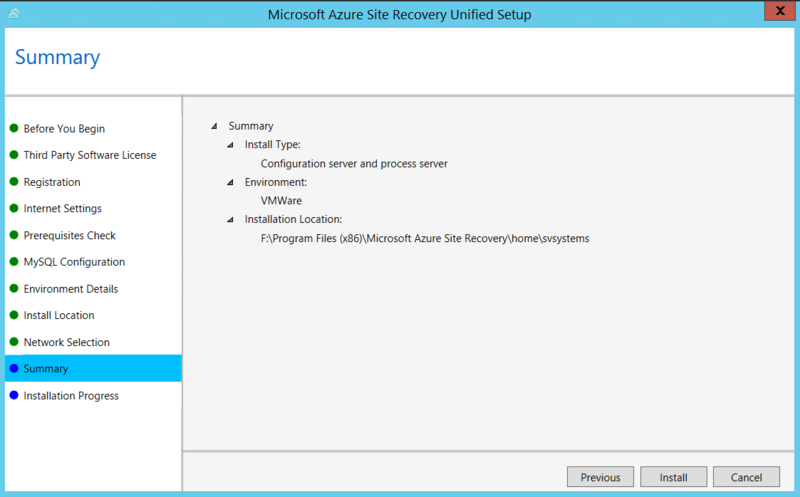 To install automatically, you need to prepare an account that Site Recovery will use to access the server. For Windows VMs, if you're not using a domain account, disable Remote User Access control on the local machine. To do this, in the register under HKEY_LOCAL_MACHINE\SOFTWARE\Microsoft\Windows\CurrentVersion\Policies\System, add the DWORD entry LocalAccountTokenFilterPolicy, with a value of 1. To add the registry entry to disable the setting from a CLI, type: REG ADD HKEY_LOCAL_MACHINE\SOFTWARE\Microsoft\Windows\CurrentVersion\Policies\System /v LocalAccountTokenFilterPolicy /t REG_DWORD /d 1. Click Create a resource > Monitoring + Management > Backup and Site Recovery. In Name, specify a friendly name to identify the vault. If you have more than one subscription, select the appropriate one. Create a resource group, or select an existing one. Specify an Azure region. To quickly access the vault from the dashboard, click Pin to dashboard > Create. The new vault will appear on the Dashboard > All resources, and on the main Recovery Services vaults page. Select what to replicate, and to replicate it to. In Protection goal, select To Azure > Not virtualized/Other. Set up the configuration server, register it in the vault, and discover VMs. Click Site Recovery > Prepare Infrastructure > Source. If you don’t have a configuration server, click +Configuration server. On the configuration server machine, make sure that the system clock is synchronized with a Time Server. It should match. If it's 15 minutes in front or behind, setup might fail. Azure Active Directory login.microsoftonline.com login.microsoftonline.us Used for access control and identity management by using Azure Active Directory. Backup *.backup.windowsazure.com *.backup.windowsazure.us Used for replication data transfer and coordination. Replication *.hypervrecoverymanager.windowsazure.com *.hypervrecoverymanager.windowsazure.us Used for replication management operations and coordination. Storage *.blob.core.windows.net *.blob.core.usgovcloudapi.net Used for access to the storage account that stores replicated data. Telemetry (optional) dc.services.visualstudio.com dc.services.visualstudio.com Used for telemetry. Time synchronization time.windows.com time.nist.gov Used to check time synchronization between system and global time in all deployments. IP address-based firewall rules should allow communication to all of the Azure URLs that are listed above over HTTPS (443) port. To simplify and limit the IP Ranges, it is recommended that URL filtering be done. Commercial IPs - Allow the Azure Datacenter IP Ranges, and the HTTPS (443) port. Allow IP address ranges for the Azure region of your subscription to support the AAD, Backup, Replication, and Storage URLs. Government IPs - Allow the Azure Government Datacenter IP Ranges, and the HTTPS (443) port for all USGov Regions (Virginia, Texas, Arizona, and Iowa) to support AAD, Backup, Replication, and Storage URLs. Run Unified Setup as a Local Administrator, to install the configuration server. The process server and the master target server are also installed by default on the configuration server. In Third Party Software License, click I Accept to download and install MySQL. 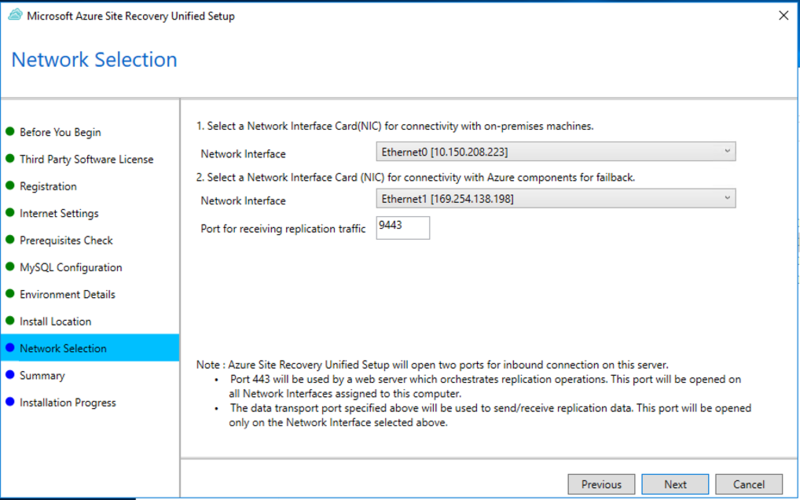 In Internet Settings, specify how the Provider running on the configuration server connects to Azure Site Recovery over the Internet. Make sure you've allowed the required URLs. 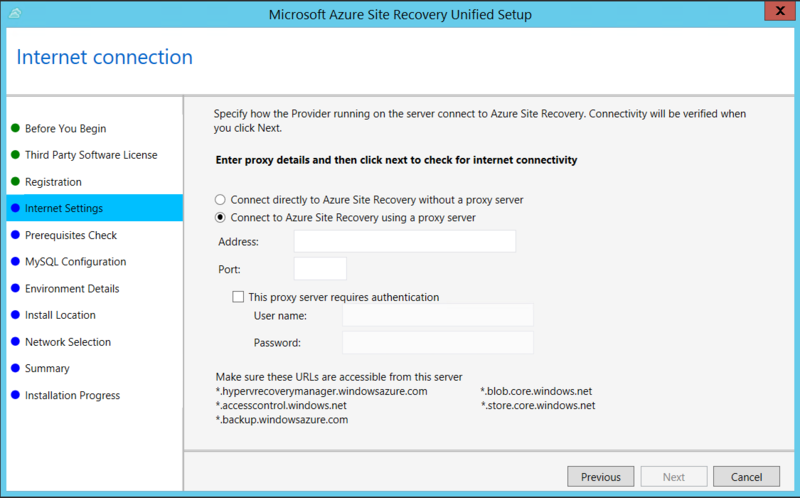 If you want to connect with the proxy that's currently set up on the machine, select Connect to Azure Site Recovery using a proxy server. If the existing proxy requires authentication, or if you want to use a custom proxy for the Provider connection, select Connect with custom proxy settings, and specify the address, port, and credentials. In Environment Details, select No if you're replicating Azure Stack VMs or physical servers. In Network Selection, first select the NIC that the in-built process server uses for discovery and push installation of mobility service on source machines, and then select the NIC that Configuration Server uses for connectivity with Azure. Port 9443 is the default port used for sending and receiving replication traffic, but you can modify this port number to suit your environment's requirements. In addition to the port 9443, we also open port 443, which is used by a web server to orchestrate replication operations. Do not use port 443 for sending or receiving replication traffic. In Summary, review the information and click Install. When installation finishes, a passphrase is generated. You will need this when you enable replication, so copy it and keep it in a secure location. After registration finishes, the server is displayed on the Settings > Servers blade in the vault. After registration finishes, the configuration server is displayed on the Settings > Servers page in the vault. Specify the target deployment model. The policy is automatically associated with the configuration server. By default, a matching policy is automatically created for failback. For example, if the replication policy is rep-policy then a failback policy rep-policy-failback is created. 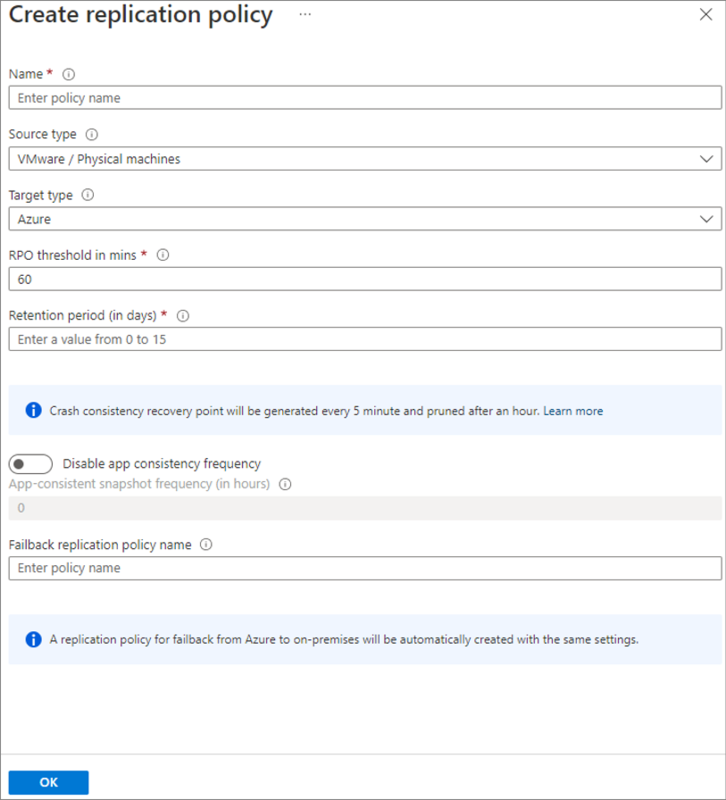 This policy isn't used until you initiate a failback from Azure. Enable replication for each server. 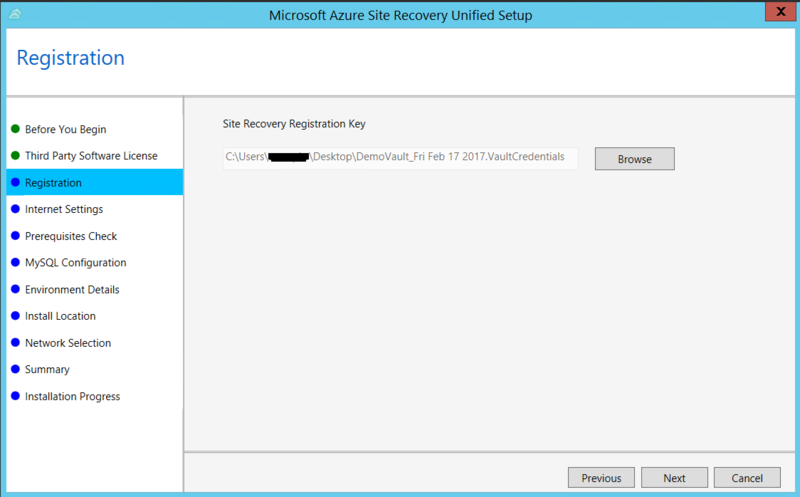 Site Recovery will install the Mobility service when replication is enabled. When you enable replication for a server, it can take 15 minutes or longer for changes to take effect, and appear in the portal. Select the Azure network and subnet to which Azure VMs will connect, when they're created after failover. To monitor servers you add, you can check the last discovered time for them in Configuration Servers > Last Contact At. To add machines without waiting for a scheduled discovery time, highlight the configuration server (don’t click it), and click Refresh. Run a disaster recovery drill.